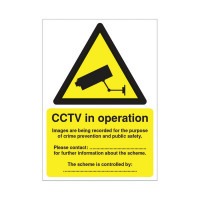 Designed to discourage criminal activity, this sign warns of CCTV cameras in operation. Ideal for use in a variety of locations, this sign helps keep your building secure. The universal symbol and recognisable yellow and black colour scheme instantly categorises this as a warning sign on sight, designed to inform employees, visitors and others. This handy sign has a self-adhesive back for mounting to walls and other surfaces without the need for tools. 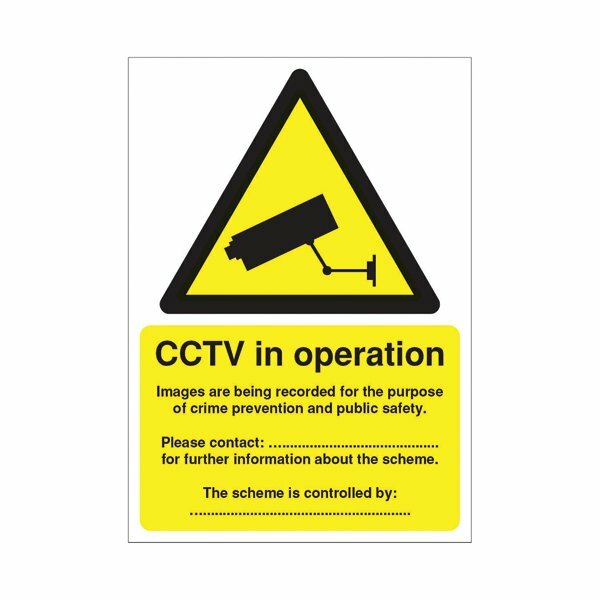 This sign is Data Protection Act compliant, with space for information regarding who to contact for more information about your company's CCTV procedures. This sign is A5 in size.